La primavera, even the name seems to promise the joy of spring - welcome to a burgeoning issue of the Marche Voyager quarterly newsletter. World-class chefs frequently wax lyrical about Tuscan Chianina beef, considered by many as some of the finest there is, but few know that just over the border the closely-related razza bovina Marchigiana, provides beef as good if not better. The large white cattle are blessed with DOP, or protected source status and are often taken up to summer pastures in the region's mountain areas. A good place to try the meat of these hardy oxen is at the annual Festa della Bistecca at Auditore in the far north of Le Marche over the weekend of 14 and 15 May. 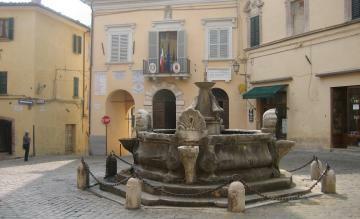 This month's image of one of the region's 500 or so piazze features a typical little main square from one of Le Marche's smaller towns, in this case Serra San Quirico. Nothing particularly outstanding, but the florid fountain and flag-draped town hall behind make it somehow so evocative. The prestigious Italian food and wine magazine Gambero Rosso has given seventeen of its celebrated annual Tre Bicchieri awards for Italy's finest wines to Marche producers this year. And in the special awards category the overall winner for the best value wine in Italy went to a Verdicchio dei Castelli di Jesi Classico. The annual Fritto Misto festival at Ascoli Piceno features a feast of deep fried food - including the town's signature stuffed olives - from Thursday 28 April to Sunday 1 May. Last year's event apparently attracted 90,000 visitors, so get there early if you want to try a wide range of deep-fried wickedness from Italy and abroad. A major exhibition of works by Lorenzo Lotto (1480-1556), the outstanding Late Renaissance artist who spent most of his working life in Le Marche, is currently taking place in Rome. Some 70 pieces by Lotto are on show in the prestigious Scuderie Gallery of the Quirinal Palace until 12 June 2011. A number of towns across Italy mark the week before Easter - particularly Good Friday - with full-scale costumed re-enactments of the biblical Passion of Christ. Perhaps the most striking of these passioni viventi in Le Marche is La Turba at Cantiano in Pesaro & Urbino province (PU) which this year takes place on Friday 22 April. Last summer we ran a piece on the use of onions at Urbania in Pesaro & Urbino province to foretell the coming year's weather. The secret of reading the onions of Urbania is said to date back to Medieval times and is currently guarded by Signora Emanuela Forlini, a local teacher who inherited the skill from her father and grandfather. You can watch a video here with Signora Forlini giving her forecast for 2011 (in Italian). Frances Mayes, author of the flit-lit classic Under the Tuscan Sun, recently featured Ascoli Piceno in Le Marche in her round-up of "10 great places to go off the beaten path in Italy" in America's widely-read USA Today newspaper. One of the most decisive battles in the second Punic War took place on the banks of the Metauro river in the northern Marche in 207 BC. The Battle of the Metaurus saw the Romans roundly defeat Hasdrubal - the brother of the renowned Hannibal - and his 30,000 Carthaginian troops, most of whom lost their lives in the battle.